"Until we have the courage to recognize cruelty for what it is - whether its victim is human or animal - we cannot expect things to be much better in this world... We cannot have peace among men whose hearts delight in killing any living creature. By every act that glorifies or even tolerates such moronic delight in killing we set back the progress of humanity"
The coming of spring is symbolised by the birth of tiny lambs perhaps more so than any other creature. Soon after the rigours of winter are over and as early as February here in the northern UK these lambs are everywhere. Tiny, fragile creatures wobbling on long spindly legs close by their attentive mothers, it is a joy to see. Gentleness and innocence is symbolised by a lamb as peace is by a dove. These gentle timid animals do no harm to any creature and are a pure delight and one of the most pleasant aspects of spring. Sadly though the life of a lamb is not very long as many are reared for slaughter, ram lambs and ewes not required for breeding are taken away from their mothers as early as July. As the ratio between ewes and rams for breeding purposes is about 40 to one more ram lambs are slaughtered young than ewes, however when a ewe has outlived her usefulness as a breeding machine she too will meet her death prematurely in the abattoir. We are a husband and wife who share a passion for sheep, no... not covered in mint jelly or worn as a coat or used as a rug, no, we understand sheep as sentient beings, who are intelligent, gentle, lively creatures who are utterly adorable, pure without guile or aggression, harmless and often submissive. Yet despite their timidity sheep at times can be inquisitive and even though they are so shy they can nonetheless be so trusting, coming up to you with expectancy in their eyes, eyes which are full of life. My husband John and our son Kevin first became more aware of the sentience of sheep during the many holidays we spent in the Yorkshire Dales before eventually moving from the Southeast to the Northeast in recent years. Since then our passion for sheep has grown as has our awareness of them as thinking, feeling, intelligent animals. We had already become vegetarians (for more about this please see Our Story) since the early 1990s as a result of our increasing unease concerning not only the eating of meat, but also the exploitative and abusive treatment of animals in many other ways we had previously not considered. This website is dedicated to sheep, it is a celebration of sheep, one of the most gentle of creatures on the planet. But our website is not only about sheep. This website also concerns all farm and other animals who are abused and exploited by man, which sadly to some degree includes most species on the planet! 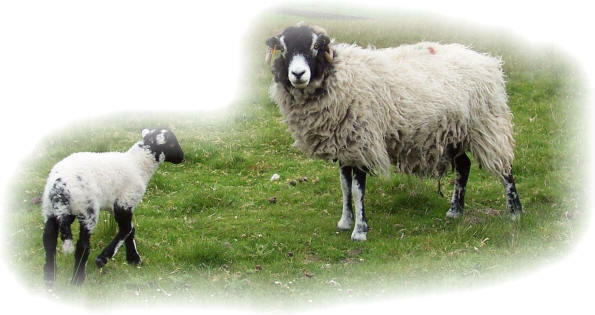 We intend for this website to include a variety of interesting as well as informative information about sheep along with other farm and animals who are exploited for food, as labour, entertainment or medical research. The website was originally intended to include only sheep and then mostly matters of interest, such as history and breeds. However after much consideration, research and many tears as the result of such research which highlights the extent, far beyond anything we could ever imagine possible concerning the cruel treatment of animals, the purpose has changed from one of providing solely interesting information to a website which will also focus on the plight of animals. We hope that in some small way we will change the perspective of some of the majority of people who condone the exploitation of animals as food, labour, entertainment, experimentation and so on. The intention is to make people think differently about animals and to come to the realisation that they, like us, are intelligent, self aware, cognitive thinking beings, capable of experiencing both pain and joy on both a physical and emotional level, in other words sentient beings. Our website though will not entirely consist of depressing accounts of animal abuse. We would like to demonstrate by our own experiences during our many excursions into our locality where we have come into contact with farm animals, and also the experiences of others, that animals are not only intelligent, cognitive and self aware but that they are kind, compassionate beings who contrary to popular belief do help and tend to one another's needs. It is our greatest wish that by setting up this website it will in some small way make a difference; even if it makes only a few people think differently about our relationship with animals as creatures with whom we share this world rather than commodities for our use, we will consider our endeavour well worth the time and effort. We long for a world free from cruelty to any animal, and that includes the animal called man. We would like a world where harming any creature no matter how small or lowly is regarded as wrong, a world were every animal is treated with respect and allowed to live out the natural expanse of his or her life, unharmed unmolested and unabused, a world were every creature dies from natural causes and not rounded up, imprisoned in cramped windowless sheds (factory farming) and killed to provide one animal (man) with meat, a food he does not need and is not biologically designed to consume, a food the production of which results in world poverty, the destruction of the rain forests, the murder of millions of innocent beings and contributes to global warming. 9 billion people, it is in fact the production of meat that adds to the causes of starvation and serves as a detriment to the environment. These issues I hope to discuss in several articles I and others are working on. We would like to live in a world where the human animal ceases to exploit other creatures for meat, fur, wool, milk or uses them for his own needs, such as entertainment such as circuses horse ridding and so on, or as working animals - for instance to detect mines, as in the case of Pouch Rats in Africa who sniff out landmines in Mozambique or the so called working dog, the situation where one animal is used to control another, such as sheep dogs who in some cases are treated inhumanely, as is one case of a sheep dog we have seen who is tethered, unless he is working, with only the shelter of a tiny "kennel" with dirty straw and on occasion no water in his filthy bowl. Concerning the word pet. I prefer to describe animals with whom we share our lives as companion animals. However for ease of use and to avoid confusion I will use the word pet, with which most people are familiar, to describe these animals. Although personally unless there is good reason, such as to care for an animal who has been abused and is unable to care for his or herself, I consider that animals should not be kept as pets, particularly caged animals. Finally, animals are not just things, they are feeling breathing creatures who fear pain, experience loss and isolation. Hear the frantic bleating of a sheep who finds himself alone, see the depression in the eyes and in the demeanour of the caged animal and you can have no doubt in your mind. We are against animal testing and experimentation in any circumstance. We are also against farming in all its forms, hunting, and the use of animals for labour. We advocate universal veganism and believe that all creatures have a right to life irrespective of species or intellect and that all creatures have the right to live out their lives free from exploitation, abuse and cruelty.